ANSELL's HyFlex general purpose glove range has expanded from the ground-breaking HyFlex 11-800 Foam to contain a broad range of variants designed to meet the changing and increasingly diverse needs of the industrial workforce. The combination of breathability, flexibility, excellent fit and protection helps end-users achieve a new level of productivity and safety in the work place. This is good news for employees who can realise an increase bottom line with greater output and less injury related costs. * HyFlex CR+ 11-501, an extension of the HyFlex CR 11-500, features innovative Intercept Technology - a brand new yarn that contains a combination of spandex, cotton, Kevlar and a stainless steel thread for high level cut protection, without compromising comfort and flexibility. 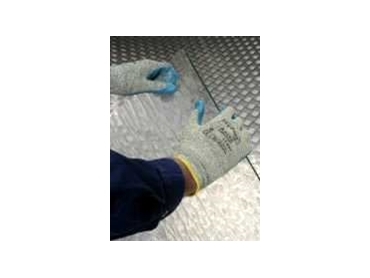 * HyFlex Dyneema 11-629 - features Dyneema, a cut resistant yarn that offers high levels of abrasion and comfort with excellent dexterity and grip.